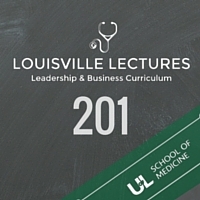 This is a curated collection of TED talks and readings that are used in the Distinction in Business and Leadership Track at the University of Louisville School of Medicine. The Distinction tracks are extracurricular pathways in the undergraduate medical school that provide students with mentorship and education in specific disciplines: research, medical education, global health and business/leadership. The Faculty for the Business and Leadership Track are Dr. In Kim and Dr. Brad Sutton. Dr. In Kim is a professor of Pediatrics in the Department of Pediatric Emergency Medicine at University of Louisville. He has an extensive background in research and management. He is internationally known as a leader in helium-oxygen (heliox) research for respiratory diseases. As a Fellowship Training Program Director in Pediatric Emergency Medicine for 12 years, he has built a nationally recognized brand of teaching excellence in medical education. His clinical medical background is supplemented by a M.B.A. degree. His program has won 5 national awards for best research at the American Academy of Pediatrics Meeting over the past 10 years proving recognition of his considerable contributions to the medical community. Dr. Brad Sutton is an assistant professor of Medicine in the Cardiology Department where he specializes in electrophysiology. He also serves at the Assistant Dean for Health Strategy and Innovation - he is the Founder and Director of the Center for Health Process Innovation at the University of Louisville School of Medicine. He serves in a number of other administrative roles including as Chief Medical Officer for University of Louisville Physicians (the area's largest multispecialty practice) and as Medical Director for the Department of Medicine Outpatient Clinics. He co-directs the MD/MBA Joint Degree Program and the Distinction Track in Business and Leadership. Website designed by Laura Bishop, M.D. Simon Sinek has a simple but powerful moder for inspirational leadership -- starting with a golden circle and the question "Why?" His examples include Apple, Martin Luther King and the Wright brothers. This talk starts slowly, we recommend beginning around 4 minutes and 50 seconds into the talk. What motivates us to work? Contrary to conventional wisdom, it isn't just money. But it's not exactly joy either. It seems that most of us thrive by making constant progress and feeling a sense of purpose. Behavioral economist Dan Ariely presents two eye-opneing experiments that reveal our unexpected and nuanced attitudes toward meaning in our work. With help from some surprising footage, Derek Sivers explains how movements really get started. (Hint: It takes two). Katherine Fortier is a child and educational psychologist in the U.S. and the Netherlands specializing in psycho-educational consultations. In this TEDx talk, she discusses the value of emotional intelligence as opposed to IQ which is often looked to as the primary measure of intelligence. Happiness and love are rooted in personal relationships. Learn the four stages of developing your awareness and emotional management skills. DIscover why EQ is even more important than IQ to your success and fulfillment. In our louder and louder world, says sound expert, Julian Treasure, "We are losing our listening." In this short, fascinating talk, Treasure shares five ways to re-tune your ears for conscious listening -- to other people and the world around you. "It's actually really important that you succeed at what you're succeeding at, but that isn't going to be the measure of your life." Too often, we measure success in life against the progress we make in our careers. But how can we ensure we're not straying from our values as humans along the way? Clayton Christensen, Harvard Business School professor and world-renowned innovation guru, examines the daily decisions that define our lives and encourages all of us to think about what is truly important. An epidemic of bad, inefficient, overcrowded meetings is plaguing the world's businesses -- and making workers miserable. David Grady has some ideas on how to stop it. John Kotter discusses the difference between "change management" and "change leadership" and whether it's just a matter of semantics. We believe we should work hard in order to be happy, but could we be thinking about backwards? In this fast-moving and very funny talk, psychologist Shawn Achor argues that, actually, happiness inspires us to be more productive. Clay Christensen explains his landmark theory of disruptive innovation; utilizing a simple product that can displace existing competitors. Economics writer Tim Harford studies complex systems -- and finds a surprising link among the successful ones: They were build through trial and error. In this sparkling talk, he asks us to embrace our randomness and start making better mistakes. With profound simplicity, Coach John Wooden redefines sucess and urges us all to pursue the best in ourselves. In this inspiring talk he shares the advice he gave his players at UCLA, quotes poetry and remembers his father's wisdom. Alain de Botton examines our ideas of success and failure -- and questions the assumptions underlying these two judgements. Is success always earned? Is failure? He makes an eloquent, witty case to move beyond snobbery to find true pleasure in our work. When two people are trying to make a deal -- whether they're competing or cooperating -- what's really going on inside their brains? Behavioral economist Colin Camerer shows research that reveals how badly we predict what others are thinking. Bonus: He presents an unexpected study that shows chimpanzees might just be better at it. Dr. Sean Richardson takes lessons learned from the professional athlete's locker room to provide an overview of the subtleties of human brain & behaviour function to facilitate overcoming the normal & predictable human barriers to success. Conductor Charles Hazlewood talks about the role of trust in musical leadership -- then shows how it works, as he conducts the Scottish Ensemble onstage. In this Princeton University graduation address, Amazon founder Jeff Bezos makes the case that our character is reflected not in the gifts we're endowed with at birth, but by the choices we make over the course of a lifetime.